Due to time constraints Jacqueline can only offer Distant Kinesiology. In order to understand how ‘Distant Kinesiology’ works it is advisable to read the information below on Kinesiology as this will give you the basis to understand distant kinesiology. Kinesiology (pronounced Kin-easy-ology) is a non-invasive method of the scientific study of movement (from the Greek "kinesis," meaning motion) which uses muscle testing to determine imbalances or disharmonies in the mind, body, or spirit. Kinesiology combines Western technology and oriental principles of energy flow. All muscles, organs, systems and glands of the body are linked by a network of invisible energy channels known as Meridians, through which when the body is healthy, energy flows freely. However, when these channels are blocked a reduced energy flow leads to a weakening of the relevant body system, affecting the muscles and organs that are related to it. All imbalances in the body can be detected by testing the tension in specific muscles, and this will indicate physical, chemical, mental and spiritual health. Any imbalances a person or animal has are detected by monitoring their ability to hold their muscles against a light pressure (as seen in the picture below). 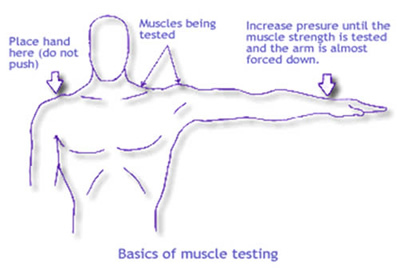 Manual muscle testing is used to find the imbalances in the body. Pressure is applied to a person’s leg or arm and the same when touching an animal near to themselves. Then the person is asked to maintain the original position where a specific muscle is contracted. 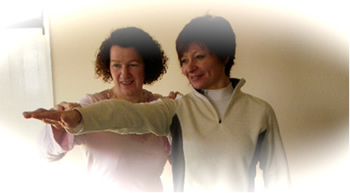 The practitioner touches a particular body part linked by an energy channel to that muscle. If the patient can resist the pressure on his or her arm or leg, it shows that the body part is healthy. However, if the patient fails to resist the pressure, it means there is an energy imbalance, a weakness in that particular body part. Kinesiology can detect where the problem is and its possible causes to include which therapies will give the best result without wasting time and money. Diet and lifestyle are also taken into consideration. Each time a muscle is tested this will respond to external influences and changes. So imagine a spongy muscle as being ‘off’, out of balance, a weakness, where a balanced muscle would be strong, able to resist against pressure. When a relevant remedy is introduced to the person or animal such as a Aromatherapy oil, Essence or Homeopathic remedy this can strengthen the relevant Meridian/energy channel indicating that the remedy would bring about a change for the better, a recovery (as seen in the pictures above). The exact treatment that you or your animal will need, depends on the feedback their body gives through the muscle testing. This tells the practitioner what the body needs to return to good health and full body function. The treatments recommended would include one or more of the following: Shiatsu, Reiki, Aromatherapy, Flower Essence, Homeopathic remedies, Herbs, Vitamin and mineral supplements to include some changes in their own life style if needed. Please note that due to time constraints Jacqueline can only offer Distant Kinesiology Consultations. To have one done for you just follow the link for further information and fill out and send back your consent form to ensure your booking. Click here to learn about Distant Kinesiology.